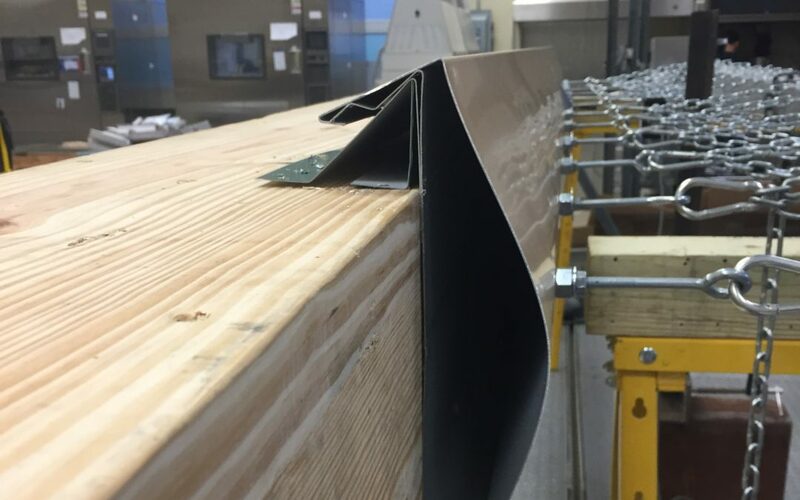 It is SPRI’s position that for edge securement products to comply with Section 1504.5 of the IBC each edge securement product must be tested for resistance in accordance with test methods RE-1, RE-2 and RE-3 of ANSI/SPRI ES-1 and that the testing must be conducted for each fabricator that produces the product. Due to the variations in materials, equipment, fabrication methods, and quality control, it cannot be expected or assumed that an edge system made to the same design by two different fabricators will perform the same. Therefore, it is SPRI’s opinion that each fabricator must produce the product tested per ES-1 to determine the load resistance of that product. In Section 9.0 of ANSI/SPRI ES-1 it states, “Edge system components or packaging shall contain written documentation which identifies the components which have been ES-1 tested. Documentation in the form of manufacturer’s printed product literature or letter shall be made available to the building owner or his/her representative.” Therefore, the manufacturers (fabricators) would not be able to document that the product they are supplying has been tested unless they, themselves, had fabricated and tested the product. In reference to meeting the requirements of this Section of the IBC, the question has been asked is ES-1 only a design standard, meaning that any organization can manufacture an ES-1 compliant edge simply by using an ES-1 design, or is ES-1 a “manufacturing standard”, meaning that an organization which manufacturers (fabricates) the edge system needs to demonstrate that the system meets ES-1 – as tested by an independent organization? The answer is: it is the latter, a manufacturing standard. Accordingly, each manufacturer of edge securement must test its product at an independently accredited laboratory. As an option, fabricators can be licensed to fabricate specific systems that have been tested by an independently accredited laboratory, provided that the fabricator has been audited by the testing laboratory to verify that the fabricator is manufacturing product to the same design and quality standards as the tested system. ANSI/SPRI/FM 4435 ES-1 2017 Test Standard for Edge Systems Used with Low Slope Roofing Systems is available here.